To motivating an environmental call to action? To inspiring knowledge of green and confidence in discussing it? To developing people, products or services as they relate to eco-rating systems? To kick-starting sustainability as a career or interview edge? Holley Henderson, the Common Sense Environmentalist, has smart green solutions balancing environmental stewardship with health + economic results. 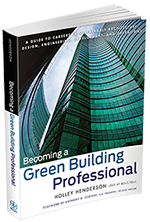 Holley is the author of Becoming a Green Building Professional. With nearly 15 years and 4 million square feet of successful green buildings around the world, she brings a wealth of experience.